Leading up to the games, many called the safety and preparedness of Rio into question, as information emerged regarding contaminated water for swimming events, heightened alerts surrounding the Zika virus, and unfinished construction. Living and working for a small travel startup in São Paulo this summer, my team and I couldn’t resist a chance to visit Rio and immerse ourselves in the excitement of the upcoming Games. So what was it really like two weekends before the Opening Ceremonies? Three main highlights from the trip included visiting the Escadaria Selarón, the Mirante Dona Marta, and Copacabana Beach. 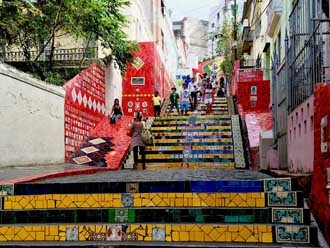 The Escadaria Selarón or “Selaron Steps” was magnificent, not only because of the composition and aesthetic of its more than 2,000 brightly-colored tiles, but also due to the mystifying story behind its artist Jorge Salarón. Selarón began creating his masterpiece in 1990 out of tiles from areas throughout the city, but later the project became global, as visitors from around the world began contributing their own. He considered the work to be in a continuous evolution and stated that he would not finish the project until “the day of my death.” 23 years later in 2013, the artist was found burned to death on the stairs and thus the 215 steps deemed complete. 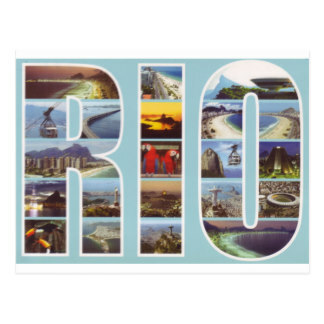 The panoramic beauty of Rio from afar is mesmerizing for all who view it. 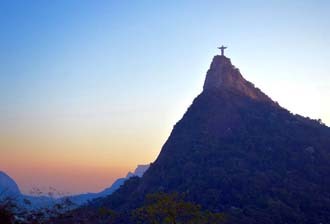 Corcovado - the mountain site of Christ the Redeemer - and Sugarloaf are popular destinations for tourists and locals looking to experience it. However, the Mirante Dona Marta is less crowded than these lookout spots and offers a tranquil and off-the-beaten path alternative. From this point, you can take in incredible views of the city, the Botafogo Bay, Christ the Redeemer, and Sugarloaf Mountain. Visitors can easily access it from the city center, and it is the perfect place to become captivated by the sight of the vibrant city and Bay. Rio offers a plethora of activities and culture to explore, and our favorite way to do so is through its magnificent food. For any foodie looking to experience traditional Brazilian street cuisine, the Copacabana beach is the place to go. Sidewalks with small food and drink stalls line this beautiful beach, and beachgoers can sit down and drink an agua de coco or caipirinha while watching the waves. We visited the beach in the late afternoon and found it to be rather deserted. However, it was clear that it would host bustling activity two weeks later when the beach volleyball competition would commence on the site. Still in a stage of transition, construction workers were in the process of setting up huge sets of bleachers and a huge statue of the Olympic Rings stood inspiringly nearby. No longer did the beach seem to offer a serene haven for people looking to spend a relaxing day at the beach, instead we felt an atmosphere of transition. 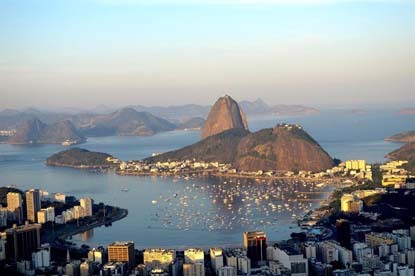 Rio de Janeiro maintains a certain charm, making it a magical city for all who embrace it. Sundays in the city are especially energetic, as community members walk, run, cycle, skateboard, and rollerblade along closed traffic lanes that line Ipanema beach. Its geographic diversity makes it not only an ideal place for tourists yearning for unique adventures, from exploring the botanical gardens to hiking on trails in the surrounding mountains, but it also makes it a fitting location for the Olympic Games. While the “heat” hadn’t quite turned up for the Olympics at the time of our visit, the growing anticipation in the city was evident. We loved our three days in Rio and are eager to return. After the Closing Ceremonies, the city will add a list of new tourist sites, including the Olympic Village. Tourists will be able to enter competition venues and receive inspiration from the more than 11,000 athletes who overcame years of perseverance and sacrifice to fulfill their Olympic dreams.